kick off proceedings to a modest crowd, happy to have the few in front of them they launch into one of the most brutal and visceral performances Norn Iron has witnessed in a very long time. By the end of the 1st song the few were many and the many were in awe! This trio laid down and gargantuan sounding soundtrack that shook you from the ground up, possibly the loudest gig in the Ulster Hall since the hayday’s of Motorhead, these guys played like they were headlining banging out killer riff after killer riff and winning over the Belfast crowd with each and every single track. Their first three tracks were over in a flash, a gnarly and savage sound pummels the crowd below whilst Mutoid Man throw out a performance as if it were from the depths of hell. 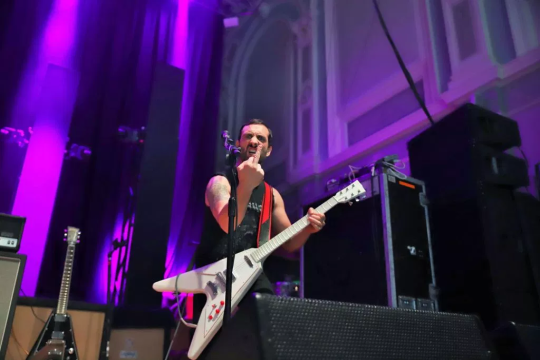 Both guitarist and bassist are adorned in Flying V’s wailing away as they give each other the finger, an epic start to a hefty and riff-tastic evenings entertainment. As the cool evening in Belfast closes in the line grows outside the Ulster Hall anticipating the doors opening. Tonight Mastodon, US heavy metal masters of sludge and stoner rock, were playing the first night of their UK & European tour. Belfast once again paves the way for a massive band. They were being supported tonight by Kvelertak and Mutoid Man. As the crowd filtered in and began to grow Mutoid Man opened up their energy for all to see. This American trio had enough energy and enthusiasm to fill the stage with their presence and the Hall with their fast, raw and powerful sound. Their set, including “Kiss of Death”, “Date with the Devil”, and “1,000 Mile Stare”, proved to everyone there that they more than deserved to be on stage. They pushed on, with a now awe inspired audience lapping it up, with a chugging freight train of a set. They played hard, fast, aggressive with a wonderful sense of mischief. Chatting to the audience every so often the roars got louder and more enthusiastic. This is a band that is on the up and if Animal from the Muppets wanted a band that would surpass his energy, then Mutoid Man is the one. Their impromptu partial cover of Led Zepplin’s “Communication Breakdown” was incredible. They already had some fans in the Ulster Hall, but by the end of their set with the last song “Gnarcissist” they had many, many more fans. Mutoid Man are a must see band.